DMR’s Katie May pulled a terrific recovery drive to take her first AR2.0 victory at the Circuito Ricardo Tormo, beating a late challenge from Marjolein Postma. Polesitter May made a strong start to the race and held off the advances of Sølvy Ødegård off the line, but was seemingly unable to get her Pirelli tyres up to temperature in the first few corners. This left her a sitting duck, and May dropped as far as 8th as the front pack were able to switch their tyres on earlier. Ødegård took the lead, pulling out a huge gap over 2nd-placed Skye Summers; the timing delta was able to reach 11.5 seconds before Summers was overtaken by Postma. The Dutchwoman was able to eat into Ødegård’s lead more effectively, but the Norwegian had enough to respond and keep the gap at a handy eight seconds. This was until Ødegård began to slow; her gearbox packed up at the end of lap 13 and the Ecurie Prenois team were left with their heads in their hands. Postma assumed the lead at this point, and May was catching the Vivendi driver at a vast rate of knots. May had dispelled the gap by lap 19, and made a move with just three laps to go, taking the lead. Postma wasn’t out for the count yet though, as she made capitalised on a late slip from May to wrest back control the following lap. May stayed close with Postma, and managed to take her slipstream before diving into Turn 1 on the penultimate lap; although Postma put up a sturdy defense, May had the line and the confidence to make the move permanent. Surprisingly, this was DMR’s first victory since 2015 in the series. 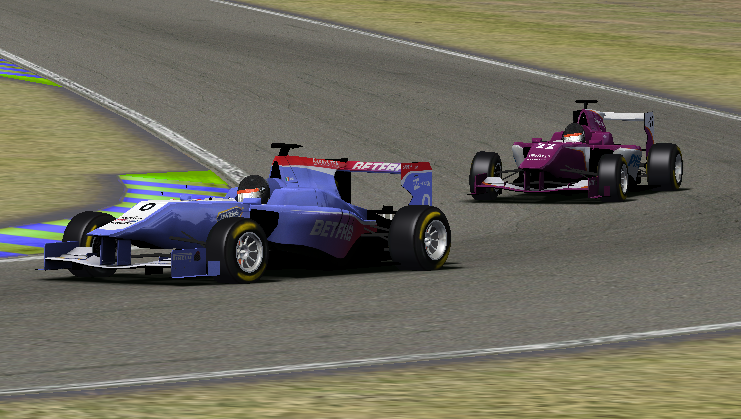 The battle for 3rd place was equally enthralling, and Summers was the incumbent for the first half of the race. The DPL’s engine then cried enough on lap 11, allowing May through prior to Ødegård’s retirement. These events set up a huge battle between Vaclav Malsyz, Gregg Donnelly, Kevin van Kerckhoven and Jazmin Caldeiro; Malsyz looked to have the position sewn up, before he too suffered an engine failure. Donnelly and van Kerckhoven battled robustly, but the Belgian stole the position on the final lap. The only incident investigated was the result of an early skirmish between Yaël De Bock, Lukas Zaugg and Kyösti Pykälistö; De Bock lost control on the exit of turn 9, spinning and collecting Zaugg and Pykälistö. All three were able to hobble back to the pits, although no penalty was issued.